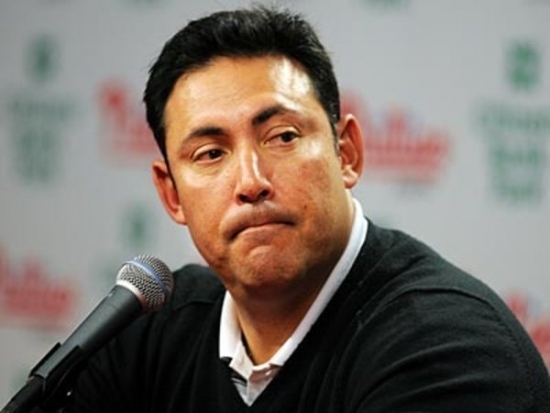 The Philadelphia Phillies announced today that they would not extend the contract of Senior Vice President and General Manager Ruben Amaro Jr. and that current Assistant GM Scott Proefrock would taken over as Interim GM effective immediately for the remainder of the season. Incoming team president Andy MacPhail made the decision. "It's never an easy decision to make a change," MacPhail said. "Ruben has had a direct impact on some of the best years in the team's history. He helped to create some great memories for Phillies fans with his accomplishments, but in order to return to a top-contending club, we believe this is the right thing to do as we continue the rebuilding process." Amaro took over the GM position in 2009 after 10 years as assistant GM. Born and raised in Philadelphia, he first started with the organization as a bat boy in the early 80's and played on the team in the 90's. Team co-owner John Middleton says the ownership group supports the decision saying, “This decision is about taking the club in a new direction and that will be facilitated by new leadership." The man who kidnapped a Philadelphia woman off a Germantown street and led police on a three-day, cross-state manhunt pled guilty today in federal court. 38-year-old Delvin Barnes told the court that he attacked and abducted 22-year-old Carlesha Freeland-Gaither because he wanted money to travel to Virginia. He instead took her hostage for three days until authorities could track them to Jessup, Maryland. It started on November 4th, 2014 when the violent abduction was caught on video along W Coulter Street in Philadelphia. Police used surveillance video, ATM transactions, and GPS before finding her bound in the trunk of the car. Barnes faces 35 years in prison under a plea deal. He is also accused of attacking a teen girl in Maryland in October 2014 and spent 8 years in prison previously for assaulting his ex-wife. A single-engine plane crashed into the Atlantic Ocean near Atlantic City, New Jersey this afternoon. The FAA says that the crash occurred around 2:45 pm Thursday about 7 miles southeast of AC. The single-engine Mooney M20 aircraft departed from Gaylord, Michigan around noon and was to land at Atlantic City International Airport at 2:51 p.m. The New Jersey State Police Marine Unit and the Coast Guard were on the scene with three vessels and helicopter and confirmed wreckage. There is no word on survivors or how many were on board.